Anthurium leptocaule Croat, sp. nov. TYPE: Panama. Code: area between La Junta and Lim—n, 5 hour walk N of Alto Calvario, 800-1,000 m, Folsom 5873 (MO 2639499, holotype; K, PMA, isotypes). Planta terrestris; caudex gracilis, internodii 8-12 cm longi; cataphyllum membranaceum deciduum; petiolus teres, anguste camplanatus adaxiale, 16-34 cm longus; lamina ovata ad ovato-triangulata, basi cordata ad subcordata, 14-26 cm longa, 8.5-24 cm lata; inflorescentia semierecta; pedunculus teres, 10-13 cm longus; spatha pallide viridis, oblongo-linearis, 7.5-9 cm longa, 1.1 cm lata; stipite ca. 5 mm longo; spadix virellus-albus ad purpureus, 7.3-11 cm longus; baccae ignotae. Terrestrial herb, 0.5-1 m tall; stems erect, green to grayish brown, drying gray; internodes 8-12 cm long, 6-8 mm diam. ; roots few per node, ca. 1-2 mm diam., spreading; leaf scars inconspicuous; cataphylls thin, drying brownish, remaining more or less intact, persisting briefly at upper nodes, then deciduous. LEAVES few, persisting at uppermost nodes; petioles 16-34 cm long, 2-4 mm diam., terete, narrowly flattened adaxially; geniculum 10-12 mm long, obscurely sulcate; blades ovate to ovate-triangular, gradually to abruptly long-acuminate (the acumen flat, apiculate), cordate to subcordate at base, 14-26 cm long, 8.5-24 cm wide, broadest usually at the base; anterior lobe 14÷30 cm long, the margins broadly rounded to straight, rarely slightly constricted near the base; posterior lobes 6-13 cm long (from apex of sinus to outermost point), directed mostly outward; sinus usually arcuate, sometimes hippocrepiform, rounded at apex; upper surface semiglossy, much paler and matte beneath; midrib acutely raised on both sides; primary lateral veins 3-7 per side, departing midrib at 40-50° angle, curved to the collective vein, weakly sunken above, raised beneath; interprimary veins usually not present; tertiary veins obscure above, conspicuous and darker green than the surface below; collective vein arising from one of the lowermost basal veins, 2-4 mm from the margin, loop-connecting the primary lateral veins. INFLORESCENCE semierect; peduncle 10-13 cm long, 2-3 mm diam., terete, one-third to three-fourths as long as the petioles; spathe pale green, oblong-linear, 7.5-9 cm long, 1.1 cm wide, acuminate at apex (the acumen narrowly inrolled), rounded at base, inserted at 45° angle on peduncle, drying with numerous minute raph-ide cells; stipe ca. 5 mm long, ca. 1.5 mm diam. ; spadix greenish white to purple; scarcely tapered, 7.3-11 cm long, 4-5 mm diam. midway, 3-4 mm diam. near apex; flowers square, 2-2.2 mm diam. 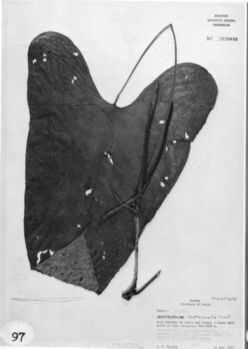 (dried), the sides moderately straight; 5-8 flowers visible in the principal spiral; tepals semiglossy, the lateral lepals ca. 1 mm wide, the inner margins broadly rounded; the pistils not exserted; stamens emerging promptly from the base, the laterals emerging throughout at least one-half of the spadix before the alternates emerge; filaments weakly exposed (at least on dried specimens); anthers (dried) narrowly ovate, 0.4-0.5 mm long, ca. 0.4 mm wide. INFRUCTESCENCE not seen. Fig. 97. Anthurium leptocaule is endemic to western Panama in Chiriquí, Bocas del Toro, Veraguas, and Code Provinces at 900 to 1,500 m in premontane rain and lower montane rain forest. It has been placed in section Xialophyllium and is distinguished by its long, slender stem (thus the name, from "lepto," meaning slender) with elongate internodes, its small thin, cordate, narrowly acuminate blades that dry brown, its slender, scarcely tapered spadix, and by its promptly deciduous spathe. The species is most closely related to Anthurium hutchisonii, which is generally a more robust plant with thicker stems that dry consistently blackened. The latter species, though widespread ranging from Chiriquí (Fortuna) to Darien in Panama, is chiefly from areas east of Veraguas and generally occurs below 1,000m. Anthurium leptocaule is one of the least understood species in Panama. Few specimens exist and reports of spadix color are inconsistent. The type specimen is reported to have a cream-colored spadix whereas Folsom et al. 5460 from the Fortuna Dam area is reported to have a purple spadix. Panama Bocas del Toro: 1200 m, 8.44N 82.17W, 11 March 198, T.B. Croat & M.H. Grayum 60357 (MO). Panama Bocas del Toro: 1000 m, 8.48N 82.12W, 5 Feb. 1984, H.W. Churchill, G. de Nevers & H. Stockwell 4636 (MO). Panama Bocas del Toro:, 25 June 1986, W.G. D'Arcy 16396 (MO). Panama Chiriquí: 1100-1135 m, 8.43N 82.17W, 8 March 1985, T.B. Croat & M.H. Grayum 59978 (MO). Panama Chiriquí: 1200-1300 m, 8.45N 82.18W, 20 June 1987, Thomas B. Croat 66512 (MO). Panama CoclŽ: 700-810 m, 08.38N 80.35W, 8 July 1994, Thomas B. Croat & Guanghua Zhu 76745 (MO). Panama Veraguas: 450 m, 8.33N 81.08W, 28 June 1987, Thomas B. Croat 66956 (MO). Colombia Antioquia: Las Orquideas, 1300-1320 m, 6.31N 76.19W, 27 Mar. 1991, J.G. Ramirez &. E. Munoz 4049 (MO).